We’ve heard reports that holiday sales were down this year. The good news is that fewer people went into debt to buy presents, preferring to pay with cash instead. So we’re putting a 180 degree spin on the old advertising slogan – buy now, pay later. This year, we moved to buy now, pay now. Let’s just take one more step – pay now, buy later. The old idea of “layaway” was used more this year than it had been for some time. K-Mart even built an ad campaign around it. It’s not as easy for retailers to administer as buy now, pay later programs – like when you use your credit card – but in today’s economy they’re just happy to make any sale. Another old idea is also seeing newfound interest – the Christmas Club. Your parents may have done it; your grandparents almost certainly did. The Christmas Clubs of old didn’t pay a lot of interest and they carried restrictive rules about early withdrawal. Good for those not disciplined enough to leave it alone. Not desirable should a true emergency arise. But you don’t need a Christmas Club Account to fund next year’s Christmas presents. You can create your own – probably using a Money Market Account or a Money Market Fund. Assume that you plan to spend $2,000 next year for Christmas presents. Right now, you could find a Money Market Account that pays around 2 percent, according to bankrate.com. If you were to invest $220 every month, starting in January, you would have your $2,000 by the end of September. Get ready to shop in October, with cash in hand! You won’t earn much interest because rates are so low right now. But look at it this way – you won’t be paying interest on next year’s Christmas presents either! funded next year’s property taxes in advance? It’s your own escrow account! set money aside to pay your insurance annually so you get a better discount? paid for your next vacation a little bit at a time before you go? Talk about stress relief! For major expenses that are several years away, you can set money aside in an account that may pay higher interest. Generally speaking, the longer you can wait to get your money back, the higher the rate of interest you’ll earn. For example, if you’re funding a car purchase three years away, you may be able to put money in a 3-year CD. The key is to match your investment time frame to when you will need the money for the obligation or opportunity. 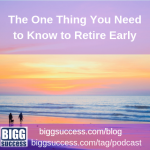 Of course, if you have outstanding debt, especially credit card debt, you’ll probably want to pay that off before you start funding other obligations – even if that means postponing, or cutting back, on discretionary expenses like a vacation. We got used to easy credit – buy now and pay later with interest. We suggest paying now and earning some interest so when you buy later you’re money ahead! Are you making your New Year’s Resolutions? Our Bigg Goal-Getters Workbook will take you through the process step-by-step. 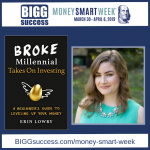 It’s free when you subscribe to the Bigg Success Weekly – it’s FREE too! Thanks so much for reading our post today. Join us next time when we ask three questions that lead to a brighter future. Until then, here’s to your bigg success!